Semiconductor manufacturing and many other industrial operations involve cleaning processes, and from environmental and health perspectives, it's become highly desirable to use physical cleaning techniques such as liquid jets or underwater ultrasound instead of toxic chemicals. Surprisingly, researchers specializing in mechanical engineering haven't paid a lot of attention to physical cleaning problems. 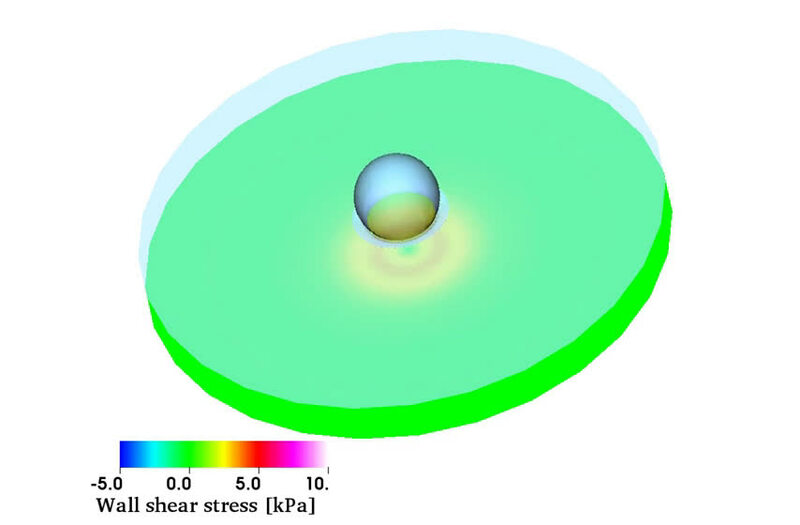 But now, mechanical engineers specializing in the mechanism of fluid motion at Keio University, in Japan, have unveiled the underlying physics of what happens when liquid jet collisions strike surfaces to be cleaned. To do this, the engineers used a fluid dynamics simulation to study the impact of water droplets against a dry/wet rigid wall as a canonical example. They report their work in the journal Physics of Fluids. "In semiconductor manufacturing, smaller-sized contaminant particles need to be removed from silicon wafers as the devices become further miniaturized," said Keita Ando, an assistant professor of mechanical engineering at Keio University. 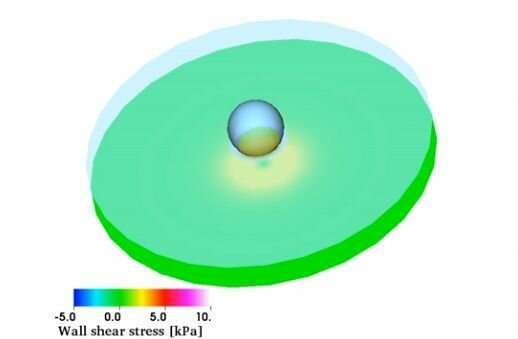 "High-speed droplet impact is favored when it comes to removing particles of very small sizes—on the order of 10 nanometers—but it can cause surface erosion." So it's necessary to consider the effects of both viscosity and compressibility of the fluid on the impact dynamics. "The fluid is viscous, so it produces a mechanical friction that plays an essential role in particle removal," he said. "In addition, the fluid is compressible, which means that it produces a water-hammer shock at the impact that may end up causing surface damage." Computational fluid dynamics (CFD) that account for both viscosity and compressibility are a big challenge, so the engineers performed the first known viscous and compressible flow simulation to carefully examine high-speed droplet impact dynamics. "The phenomena are small-sized and very fast; it is very tough to resolve them with current experimental techniques," said Ando. Why is this simulation approach so significant? It enables identifying a trade-off relationship between efficient cleaning performance—aka particle removal efficiency—and damage-free cleaning. "Our approach can be used to quantify friction force and water-hammer impact pressure," Ando said. "These are useful for exploring optimal values of the impact speed, for example, given contaminant particle properties including size. The direct impact of water droplets against dry surfaces produces high friction and impact pressure, which implies efficient but erosive cleaning." In their simulation, the engineers explored the case of initially introducing a film of water that covers the cleaning surface. Their results show that this film can cushion the droplet impact, which is crucial for less erosive cleaning. "Environmentally friendly cleaning techniques—including water jet and underwater ultrasound—will play a more important role in the future. Their technological advance has always been hindered by a lack of understanding of the underlying physics, which can now be understood," said Ando. "In addition, beyond experimental research, the CFD approach is an essential tool when it comes to the quantification of fluid flow."